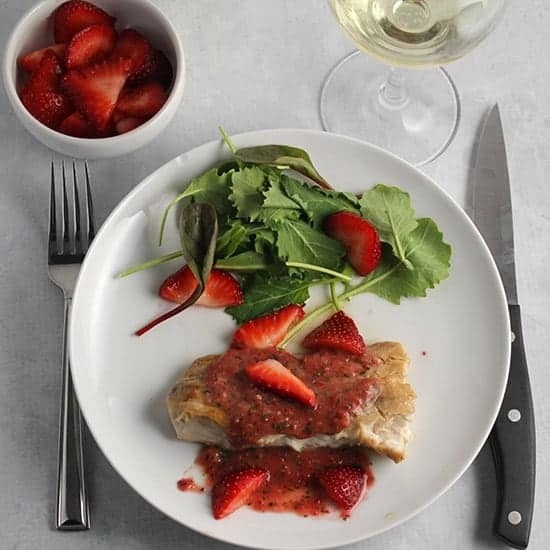 This Mahi Mahi with Strawberry Sauce recipe post is sponsored by the Florida Strawberry Growers Association in conjunction with a social media campaign through Sunday Supper LLC. All opinions are my own. Happy Valentine’s Day! A day to spend some special time with those we love, and show them how much we care. What better way to care for those we love than preparing a healthy and nutritious meal? Fresh Florida strawberries are the perfect star ingredient for a healthy and nutritious Valentine’s Day meal. There’s the deep red color and heart shape to strawberries that make them perfect for your Valentine’s plate. And Florida strawberries are so nutritious! Did you know that 8 medium strawberries provide your recommended daily allowance of vitamin C? Ward off those winter colds and get some strawberries on your plate. Sure, strawberries are great as a cereal topping, and tasty in a dessert. (check out the tasty dessert with fresh Florida strawberries we served up yesterday!). But lately I’ve been learning strawberries can make for a delicious and healthy dinner, too. The Mahi Mahi with Strawberry Sauce is a great example of that! Fruit and fish can be a great combination, doubling the health benefits on your plate. I first came up with the strawberry puree featured in today’s Mahi Mahi with Strawberry Sauce recipe when I made this Quinoa with Salmon and Strawberries recipe for a past Sunday Supper. The fresh Florida strawberries get pureed with a bit of garlic for some kick, plus basil and honey. This simple preparation lets those Florida strawberries shine. And you really want to let those strawberries shine now, as it’s peak Florida strawberry season! Great way to bring a little taste of summer into our chilly New England home. There are nine steps listed in the instructions believe, kind of a lot considering how easy and quickly this comest together. 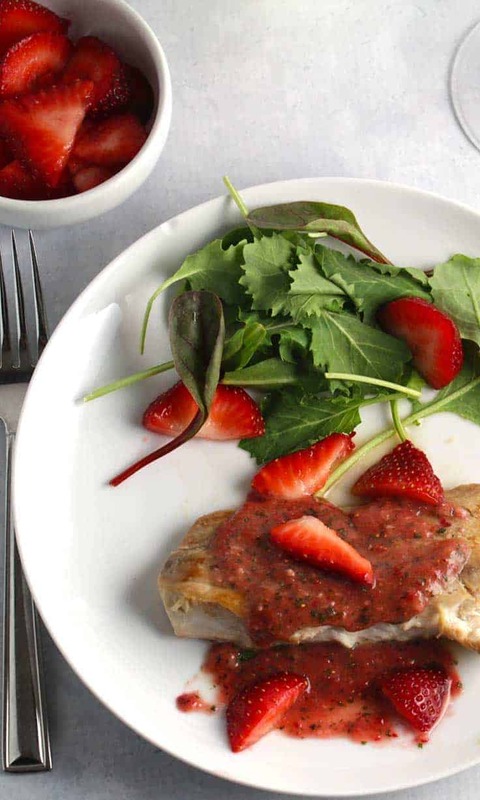 You can have Mahi Mahi with Strawberry Sauce on your plate in under 30 minutes! So if you are looking for some last minute inspiration for tonight’s supper with your valentine, you can make this happen. 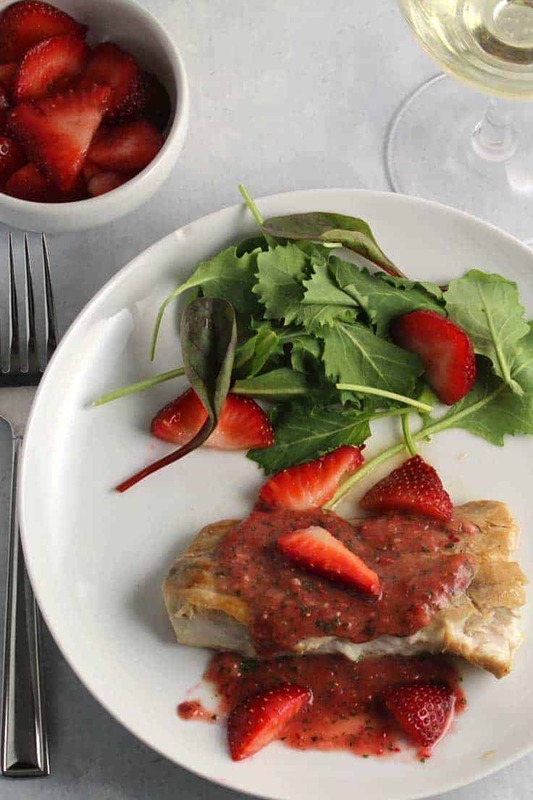 Whip up the strawberry sauce, pan sear some mahi mahi, and top it with the tasty strawberry sauce. Serve with a simple green salad and perhaps some couscous or other grain of choice. Oh, and don’t forget the bubbly! 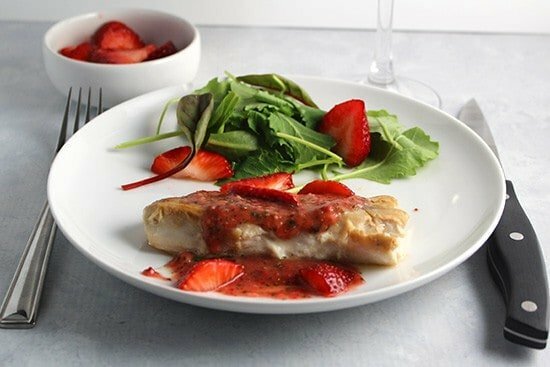 It just so happens that this Mahi Mahi with Strawberry Sauce goes perfectly with Champagne or other sparkling wine, always a nice choice for a romantic evening. I hope you and your valentine get to enjoy this recipe with some bubbly soon! Pan seared mahi mahi topped with a spicy sweet strawberry sauce. Make a quick marninade: combine one tablespoon olive oil, soy sauce and rice wine vinegar in a bowl. Add the mahi mahi to marinate. Gently turn the mahi mahi over once or twice so that it gets well coated with the marinade. Set aside for about 10 minutes. Make the strawberry sauce: combine 12 of the strawberries, garlic, basil, 1 tablespoon olive oil, honey, salt and lavender in a food processor. Puree to liquify the ingredients. You have your strawberry sauce! Slice the remaining 4 strawberries and set aside for finishing the dish. Spray a skillet with cooking oil and heat the pan on medium high. When the pan is good and hot, remove the mahi mahi from the marinade and gently shake off some of the excess marinade. Place the fish skin side down, and cook for 5 minutes without moving the fish. The skin will be getting nice and crispy underneath. Use a spatula to turn the fish over to cook with the skin side down for 3 to 4 minutes. Turn the fish back to the skin side one more time, and cook for another 2 minutes. At this point, gently cut open the fish at a thick spot to check for doneness. You want to get it so it has turned white throughout, but not overcooked. When the fish is cooked sufficiently, remove from the pan to a plate, and loosely tent with foil. Let it rest a couple of minutes before serving. Plate a portion of the mahi mahi, topped by a couple generous scoops of the strawberry sauce. Add a few slices on top of the sauce to finish the dish. Serve with a green salad and enjoy! Be sure to check out all the great Sunday Supper strawberry recipes via the links below. You can also check out the tasty photos from these recipe by checking out our the Florida Strawberry Pinterest Board. Great recipe! I never have had Mahi Mahi. I really need to try this! Thanks Shelby. Mahi Mahi is fairly mild, so a flavorful sauce can really shine with it. I really enjoy it when seafood and fruit are combined in the right way. And this is definitely the right way. Fantastic flavors for sure. seafood & fruit can definitely be a winning combo! Oh my gosh, David, this dish sounds so light and flavorful! Mahi is my fave white fish, and I am drooling thinking about the tangy strawberry sauce that tops it! Thanks Nichole, this fish definitely lends itself to a fruit topping. What a wonderful, healthy meal. It looks delicious! Mahi Mahi is one of our favorites! Great recipe! Thanks! I don’t make this as often as some other fish such as salmon, but always enjoy it when I make it. seafood & fruit definitely goes nicely! I think I just found a new sauce for my fish! Yum! I wouldn’t have thought to pair fish with strabwerries but it looks amazing! I have enjoyed other fruits with fish, and so this event with Florida strawberries was a good chance to find out how well strawberries work with seafood. A great sauce for a meaty fish like Mahi mahi! This looks so good, I’m going to try it with some tilapia for dinner this week. I bet that’d work great too, Renee! I’ve never tried fish with strawberries although I have with other fruits and that was delish! So on my to-make list soon! Up until recently that was my status, but given I liked other fruit w fish I figured correctly strawberries were worth trying! We’re big time fish lovers over here and your Mahi Mahi with that delicious sauce is right up my alley 🙂 Lovely recipe!